You can check how much space you have left using the steps below. If you find your storage is low, try deleting some of your titles before transferring again. If it looks like you've got enough storage space but you're still having trouble transferring, contact your library for more help. Make sure your NOOK is plugged into your computer. Right-click on your NOOK under "This PC," then select Properties. Control-click on your NOOK under "Devices," then select Get Info. Look for the "Available" space left on the NOOK. 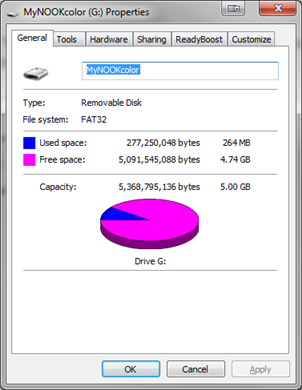 You can compare this number to the "Capacity," or total amount of space on the device.